Atheist Film Festival - Established in 2009, the Atheist Film Festival is world's first film festival dedicated to showcasing feature films, documentaries, shorts and animated cinema created especially for the secular community. Berlin and Beyond - German language film festival. Sponsored by the Goethe-Institut San Francisco. Disposable Film Festival - Created in 2007 by Carlton Evans and Eric Slatkin to celebrate the democratization of cinema made possible by low cost video technology: everyday equipment like mobile phones, pocket cameras, DSLRs and other inexpensive devices. Through screenings, workshops, competitions, panels, and other events intended to educate and inspire, the Disposable Film Festival promotes experimentation and helps build the track record needed for a new generation of filmmakers to enter and change the industry. Kicks off in San Francisco every March before traveling to cities around the world. Film on Film Foundation (FOFF) - Promotes film as a living art form by screening works from its history and stimulating its continued use in production and exhibition. See FOFF's Silent Watchdog blog and Bay Area Film Calendar. Filmjunkie Film Festival - Delancey Street Theatre at Embarcadero at Brannan. Japan Film Festival (JFFSF) - Dedicated annual Japanese film. Light Field - An international exhibition of recent and historical moving image art on celluloid, held in the San Francisco Bay Area. Mill Valley Film Festival - World premieres, independents, features, shorts, and documentaries. Noir City - The largest annual film noir festival in the world. REEL Recovery Film Festival - Using the artistic medium and venue of a four-day film festival, select feature-length, short and documentary films are presented that highlight alcohol/drug addiction and recovery. San Francisco Black Film Festival (SFBFF) - Provides a platform for Black filmmakers, screenwriters, and actors to present their art. 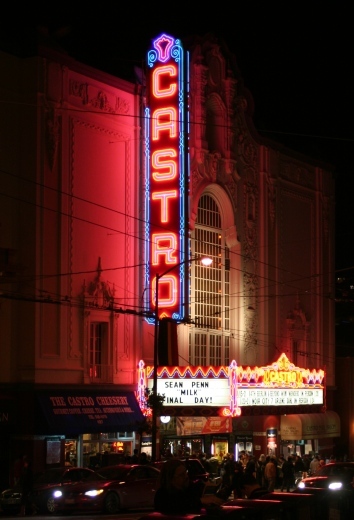 San Francisco Film Noir Festival / Noir City - Held each January at the city's Castro Theatre. San Francisco Film Society (SFFS) - Through its annual San Francisco International Film Festival and an assortment of equally anticipated events such as the yearly San Francisco International Animation Festival, New Italian Cinema and French Cinema Now, bimonthly SF360 Film+Club multimedia presentations and Film Arts Forum filmmaker gatherings, and frequent benefit screenings and film premieres, the Film Society shares the best in global moving-image arts with tens of thousands of viewers who are eager to explore images and ideas beyond the mainstream multiplex. San Francisco Green Film Festival - Seeking to inspire environmental action through media arts. With two screens showing over 70 film premieres, and a Festival Hub hosting workshops, panels, and parties, the festival gives filmmakers a unique platform for their work, and gives the audience opportunities to watch, share, discuss and act. San Francisco Independent Film Festival (IndieFest) - A venue for independent film. San Francisco International Film Festival - The oldest film festival in the Americas. San Francisco Jewish Film Festival - Independent Jewish cinema. SF Indiefest - A year-long organization presenting three two-week long festivals: the SF Independent Film Festival in February, Another Hole in the Head in June and the SF Documentary Festival in October. In addition to the film programs, IndieFest is known for throwing some great parties, including annual Roller Disco Costume Parties, the annual Big Lebowski Party and live music events. Silent Film Festival - Selects the finest 35mm prints, engages leading musicians to compose and perform live era-authentic musical scores, and invites filmmakers, authors, stars, archivists, and scholars to provide context and commentary for each film. At the Lab - 2948 16th St. at Capp St., San Francisco. Letterman Digital Arts Center - One Letterman Drive Building B (at Chestnut St. and Presidio St. near Lyon St.), San Francisco. The new San Francisco home of Lucasfilm Ltd., Industrial Light & Magic and LucasArts. Other Cinema - San Francisco. A long-standing bastion of experimental film, video, and performance in San Francisco's Mission District. San Francisco Film Society Cinema - San Francisco. A 143-seat underground cinema in San Francisco, owned and operated by VIZ Pictures. Equipped with a cutting-edge HD digital projection and THX-certified sound system, VIZ Cinema's programming focuses on the latest and hottest films from Japan, as well as an incredible legacy of classics, favorites, documentaries and anime - making it the only venue of its kind in the United States. Bay Area Film Calendar - Presented by the Film on Film Foundation (FOFF). SF360 - A vibrant daily online magazine that showcases the variety and vitality of the San Francisco Bay Area film and media scene. Also see Essential SF columns. This webpage last updated on Sunday, January 13, 2019 1:53 PM.